No matter where you work, how you work and what your job is, you’ll encounter these types of colleagues in your workplace–may it be you, your officemate sitting next to you or your boss himself. 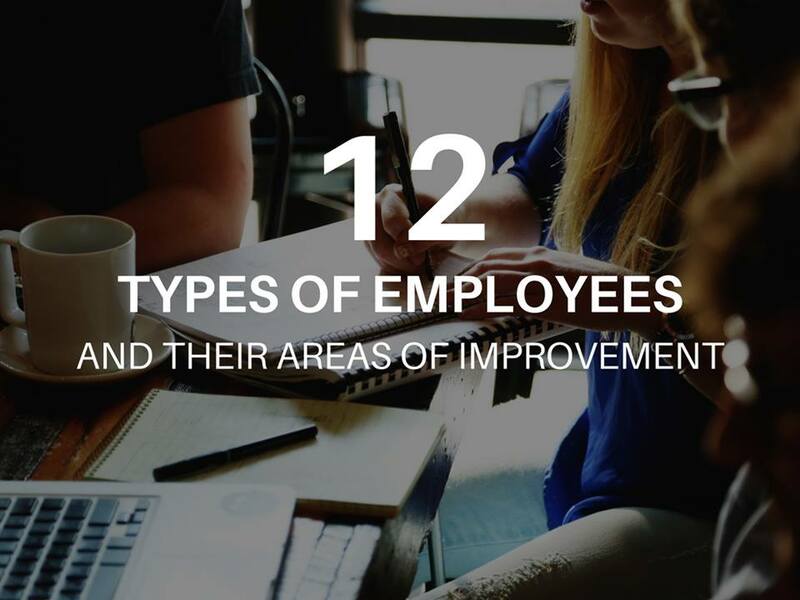 Check each one of them to know their areas of improvements. These individuals take initiative in coming up with new ideas, strategies and thoughts – they often termed as the “strategist”. They can propel the team to move forward with their excellence in creative thinking. They see the bigger picture or view than anybody else in the team and does help a lot in minimizing risks caused by wrong or poor decisions. Innovators should provide a buffer for execution of their ideas. Since they have a tendency to jump into another idea without fully executing the first one, they could paralyze the team with not yet fully acted insights. It is best if they can work with executors in their team to implement what they have in mind. Narrow ideas into small bits of details so it could be well executed. These are committed individuals who can motivate themselves despite the toxic environment. They always give their heart and soul to their work, leaving some positive impact to their colleagues. They always smile, are full of energy, and always believe that they can always get things done. Funnel your inspiration to execution. You and your team shouldn’t just get inspired but be able to deliver high-quality tasks or reports on time. While being inspirational is good, performance is still always backed up with data. While everyone in the office is panicking, problem solvers are taking seats and thinking of solutions to the current situation. They develop practical steps that can attend to immediate needs, thus elevating the performance of the team to the next level. Ask help from your direct boss. You can have the most intelligent solution to the problem, but it’s always better to seek help from authorities. They have more experience and can aid you in executing those solutions properly. You will rarely find this “all-in-one” employee, but he or she is probably one of the best assets of the company. They have almost all skills needed to succeed, are good in innovation, communicating ideas, and delivering above par individual and team work performance. Don’t be a jack-of-all trades. While you can possess all skills needed in your job, your team or your department, it is best to focus only on two or three things you’re very good at and master those skills as you grow your career. You’ll see that this person always takes initiative in leading his/her colleagues. They are good types of employees to be promoted because they can inspire their people instead of just pressuring them. They communicate their plans and thoughts on a deeper emotional level that their team members can easily understand and execute. Don’t stop learning about leadership. There’s still more to adapt and practice in this area whether you are a subordinate or you’re the boss yourself. Keep reading books and attending seminars on leadership. Improve your hard skills as well so you can better coach your subordinates. Despite having an enticing culture in the office and full salary benefits, negatron employees are always on the lookout for things to complain about. They are always unhappy and whining almost about everything – from the new look in the office to the new outfit of her boss. In most cases, negatrons bad-mouth (gossip and lies) the company to her colleagues inside her department and to her friends outside of work. Find something good in your boss and in your office. There should always be one and focus on that. May it be a hobby or passion of both you and your boss/colleague can bond with or as simple as the weekly Zumba in your office that gives you some fun. Don’t do to others what you don’t want others to do to you. Be kind to everyone. We always find this “traditional” colleague in the office. She does a “good job”, does what is told but isn’t willing to innovate or even suggest new ideas and insights to the team. She normally has been an average contributor to the company, leaving just an average of 7/10 in her annual performance review. People in the office loves her for she doesn’t complain nor bad-mouth. She respects workinghours, her colleagues and is always delivering output on time. Traditional employees can do more what they are just asked by their bosses. They can always do better job than yesterday. Have a burning desire to excel and be the outstanding employee of the company. They might be promoted in the next few years because of their “average” performance, but isn’t it better if that can achieve that in lesser time. Best tip is to set career goals as early as the first quarter of the year. This type of job hoppers aren’t looking for new jobs for better career opportunities, but simply just seeking for a “perfect” company. While this is good to be true, it doesn’t happen all the time. Purposeless job hoppers don’t have any valid reason in quitting their job and usually stays less than a year, or worst, less than six months. They have a long list of job experiences in their resumes with less than 4 months stay in each of the four companies. Stay in the company a little longer (working for two months and saying you’re not fit to the culture isn’t wise). Start building authentic relationships with colleagues and with your boss. Over time, this can help you find and learn untapped career opportunities inside the company instead of just clocking in and out and doing meaningless work. These are people who oppose change, whether it is a normal exchange of tasks between one person and the other or as simple as introducing him to a new boss who is more capable of handling the team. Their “comfort-zone” mindset paralyzes them, which affects their productivity and work performance. They are typically afraid of the future, thus, not helping them concentrate on their present work. Ask immediate training from your boss or organizational development/training team of your company if you need to learn new trends and strategies brought by the new changes in your company. Improve your flow of communication with your boss and with your other bosses to get hints on the future updates in your department. This could help you prepare a little early so you wouldn’t panicked when changes had been made. Battle your fear with faith that there is better growth in store for you. Their motto at work is “tomorrow is my day”. They get distracted with social media and senseless conversations with colleagues and when it’s time to submit a report at the end of the day, they always say, “I’ll do it tomorrow”. They spread “unproductivity” influence in the whole group and entice others to do as they are doing. They care less about work performance usually do things at the last minute. Be true to yourself. Admit that you procrastinate most of the time. Get projects or tasks from your boss where you’ll be held accountable for the team. This will help you take things seriously. An “unfollower employee” doesn’t want to submit himself to the authority of his boss, not because he finds faults in him but rather he has a rebellious attitude. He always test the patience of his boss by giving hard-headed actions. In a rare case, he creates a secret group of rebels in the company, which decreases the overall morale of the team. Be humble and learn to submit to your boss. There’s a reason why he is promoted, not you. Instead of just rebelling, be professional and do your work at its best, so in due time, you’ll reap the harvest of being the next boss. This type of employees always mix professional work with their personal life. They always pity themselves and get sympathy from others (while this may be good in certain times, if it’s too much, it’s not healthy anymore). They always look for attention and usually file vacation and sick leaves. Be genuine. Don’t bring personal life at work (there are perfect time for that, i.e. after office hours, etc.). Focus on your task or project so you can achieve your career goals, get your boss’ favor, and take leaves at the right time.